Ahmadi Muslims in Scotland have launched an anti-extremism campaign following the death of the Glasgow shopkeeper Asad Shah, despite the failure of other prominent Muslims to attend the event.Representatives of the Glasgow Central Mosque and the Muslim Council of Scotland were invited to attend the launch alongside other faith groups, but the Guardian understands that both sent their apologies at the last minute. Shah, who lived in the multicultural Shawlands area of Glasgow, was fatally stabbed outside his newsagents on 24 March.Shah was an Ahmadi, a member of a minority sect of Islam that faces persecution and violence in countries such as Pakistan and is treated with open hostility by many orthodox Muslims in the UK because it differs from their belief that Muhammad is the final prophet sent to guide humankind. The man charged with Shah’s murder is also a Muslim, and recently released a statement through his lawyer saying the killing was justified because Shah had “disrespected” Islam.As part of the United Against Extremism campaign, posters sponsored by the Ahmadi community will be displayed on buses in Glasgow, Edinburgh and Dundee for two weeks. Abdul Abid, president of the Ahmadiyya community in Scotland, admitted he was disappointed that other Muslim leaders had not attended the launch. 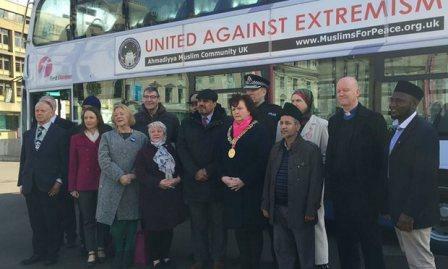 Representatives of Glasgow’s Sikh and Jewish communities and the Church of Scotland’s inter-faith group were all present, alongside local politicians, representatives of Police Scotland and Glasgow’s lord provost. Independent of the murder investigastion, Police Scotland are investigating alleged links between the head of religious events at Glasgow Central Mosque and a banned sectarian group in Pakistan. A recent BBC investigation claimed that Sabir Ali was president of Sipah-e-Sahaba, a militant political party that has accepted responsibility for deadly sectarian attacks against Shia Muslims and Ahmadiyya minorities in Pakistan, and was banned by the Home Office in 2001. Following Shah’s death, Aamer Anwar, one of Scotland’s most outspoken Muslim reformers, helped to broker a unique event where representatives of Sunni, Shia, Ahmadi and Pakistani Christian communities shared a platform for the first time, and vowed to stand shoulder to shoulder against extremism. He has since received death threats himself, which are under investigation by the police. Share the post "Scottish Muslim groups fail to attend Ahmadi anti-extremism event"